Purchase this product now and earn 12,850 Reward Points! Natural Helicobactor / Acid Reflux Support. 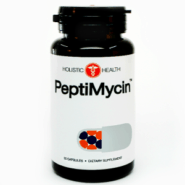 PeptiMycin aids in the body’s ability to support healthy flora in the gut. As a dietary supplement, take one capsule a day or as directed by a healthcare professional. WARNING: Do not take if pregnant or nursing without first consulting a physician. NOTICE: Store in a cool dry place and away from direct sunlight us recommended.